The format of the ESP sections and fields is described in Table 80 and shown in Figure 126. I have shown explicitly in each the encryption and authentication coverage of the fields, which will hopefully cause all that stuff I just wrote to make at least a bit more sense. 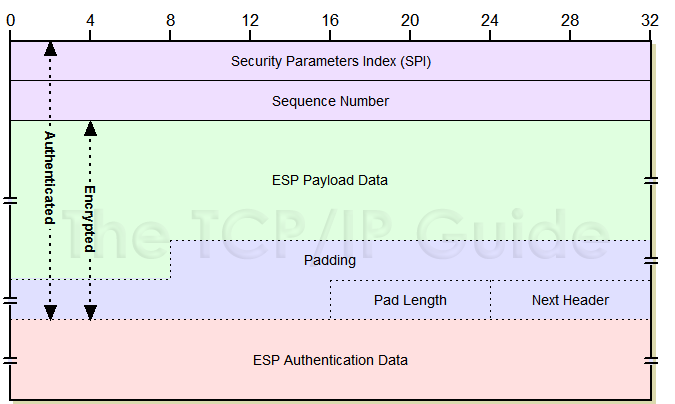 Security Parameter Index (SPI): A 32-bit value that is combined with the destination address and security protocol type to identify the security association to be used for this datagram. See the topic on security associations for more details. Sequence Number: A counter field initialized to zero when a security association is formed between two devices, and then incremented for each datagram sent using that SA. This is used to provide protection against replay attacks. Payload Data: The encrypted payload data, consisting of a higher layer message or encapsulated IP datagram. May also include support information such as an initialization vector, required by certain encryption methods. Padding: Additional padding bytes included as needed for encryption or for alignment. Pad Length: The number of bytes in the preceding Padding field. Next Header: Contains the protocol number of the next header in the datagram. Used to chain together headers. ESP Authentication Data: This field contains the Integrity Check Value (ICV) resulting from the application of the optional ESP authentication algorithm. Note that most of the fields and sections in this format are variable length. The exceptions are the SPI and Sequence Number fields, which are 4 bytes long, and the Pad Length and Next Header fields, 1 byte each. The Padding field is used when encryption algorithms require it. Padding is also used to make sure that the ESP Trailer ends on a 32-bit boundary. That is, the size of the ESP Header plus Payload plus ESP Trailer must be a multiple of 32 bits. The ESP Authentication Data must also be a multiple of 32 bits.